Hannibal History | Iowaz iowaz@swbell.net | Fotki.com, photo and video sharing made easy. 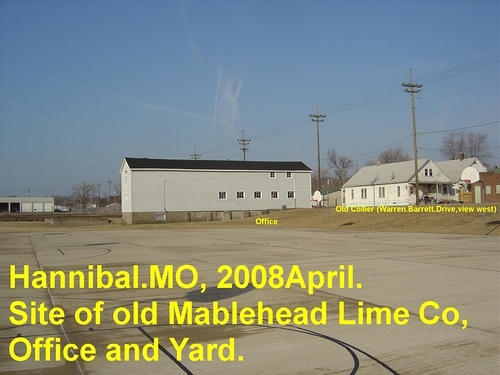 Pics around old town Hannibal that may show some of the venues depicted in the misc series of old pics of Hannibal. occer field area on the south side of Warren.Barrett Drive or just west of the baseball field. Produce was brought down from the kiln/processing area in the hills to the south, loaded on the Hannibal-St.Joseph, which ran from the Miss.River area, along the north side of Collier.St (Warren.Barrett.Dr), and shipped westward. Lime was a much needed quantity for building, industry, whitewashing, etc. Mark Twain Bridge approach, view from Lover's Leap, Cave entrance, Twain home area. Misc old pics of Hannibal saved from various sources. over a hundred years. Much of the lime was shipped by rail toward cities and westward to newly opened territory, having bulding, industrial and household uses. Lime was an extermely important product for pioneer communities. eet Bridge area, Fall 2005, Hannibal, Missouri. Some views look pristine but in reality Bear Creek remains a trash dump for physical and chemical products from the mouth all the way beyond Hwy 61. Along lower Bear Creek from the Rickey Hollow Bridge downstream to the South Main Street Bridge, Fall 2006, Hannibal, Missouri. Hannibal. The remainer of the bed has been 'given back to progress' or abandoned to locals or used for trash dumping. Construction of the H&StJ began in the mid 1850's and progressed until by early 1860's the H&StJ was the first railroad running westward from the Mississippi to the Missouri River area. Thus Hannibal for a short few decades was historically an extremely important river/rail port. There are still three steel bridges remaining along the bed in Hannibal, but the remaining ties were removed sometime in the 1970's. Access across the bridge on the west end has been eliminated in the past few years by wire mesh at both ends of the bridge; probably done by the city(?). There is no convenient way around the west bridge so the rail bed cannot presently be walked end-to-end. Nearly all of the environment along the bed and creek is full of trash, junk, chemicals, etc. Trash town at it best! The stone work remains on the Mississippi River front on the south bank of the mouth of Bear (Hannibal) Creek. bal, MO. Nealy 100% of the Mississippi River Valley has been sterilized for progress. What is the delay, get the remainder channelized, plowed, asphalted!! Mississippi River front from the deck of the 'Mark Twain Riverboat' owned and operated by Captain Terry. Views of the Mississippi River area at Hannibal, Missouri, from the Illinois side of the River. Along the River Front of Hannibal Missouri on a cloudy, cool, October day. Pics from the deck of Captain Terry's Mark Twain River Boat. File names describe the pic. Pics in the old town area, Hannibal, Missouri. View across the Mississippi River of Hannibal Missouri taken from the Illinois Landing area at the "Old Bridge" approach, plus a few views from Lovers Leap. Historic Main Street of the Mississippi River and rail port saw hundreds of thousands of pioneers as the moved westward. Views of the outside area of the Clemens home on Hill Street overlookiing the Mississippi River Port of Hannibal Missouri. Grants Drug Store faces Main Street but sits across Hill Street from the Clemen's Home. Becky Thatcher's home was across Hill Street from Tom Saywer's, in Twain's Hannibal Missouri. as around the corner on Main St, but later for historic purposes to its present location across from the Twain home on Hill Street. ontains many Hannibal area surnames including the Clemens' plot in the Old Yard. There is a folder containing panoramas of each section in Mt. Olivet in the Iowaz Fotki Site. Views inside the Clemen's home on Hill Street, Hannibal, Missouri. Every year 7th graders compete to represent Hannibal as Tom and Becky. Five couples act as Tom's and Becky's with one selected as thee Tom/Becky. Tom and Huck are at the base of Cardiff Hill at the north end of Historic Main Street in Hannibal Missouri. toric Main Street, Hannibal, Missouri. The building was taken over from a pizza place. This corner was the site of one of historic lumber yards. The stone wall was built during the CCC days of the 1930's to buffer the historic buildings from a possible lumber yard fire. tour entry Museum 1. An old department store was rebuilt in the 1990's to house offices, gift shop, displays, etc. Mississippi Queen in port at Hannbial, Missuri, viewed from across the Mississippi River from the Illinois Landing. The Mississippi Queen docked at the River Front Landing in Hannibal, Missouri. Close views of the Mississippi Queen while in port at Hannibal, Missouri. Views from Lovers Leap with the Mississippi Queen in port. The Misissippi Queen viewed from the north point of Riverview Park, as it leaves Hannibal, Missouri, on its trip from St. Louis to the Twin Cities.